March | 2014 | ohdenny. Khao San Road at 326 Adelaide St, Toronto was one of the highlights when visiting Toronto. I never knew Thai food could be done so well outside of Thailand and especially in a place like Toronto where the climate seems so disparate. Nonetheless, Khao San Road is extremely popular with the locals and even on weeknights you can see people waiting around for a table and after dining here you can certainly see why. 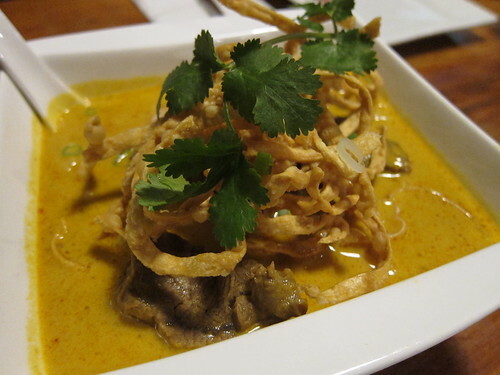 Pictured above, we have the Khao Soi which is a egg noodles curry with coconut milk, crispy noodles, scallions, coriander, and lime. 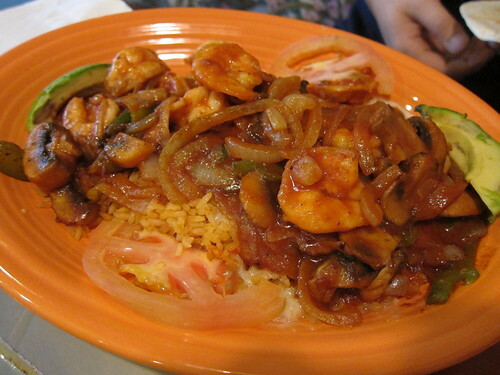 You can also choose from chicken, beef and tofu or shrimp for extra. It was this wonderful creaminess to it, but not overwhelming or too rich. 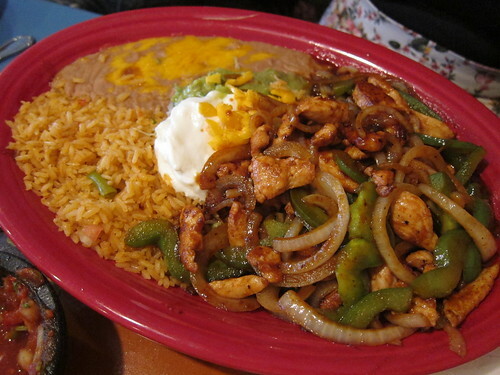 The subtle spices just alight your tastebuds and create a warming aroma. 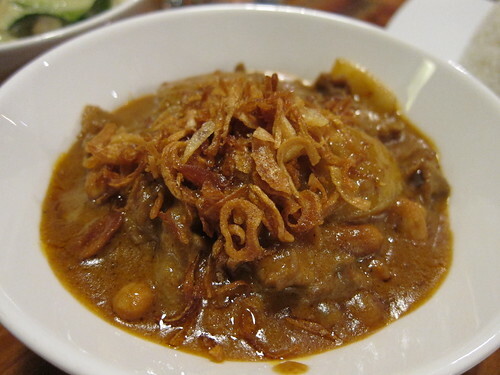 My favourite dish of the night was the Massaman curry, I absolutely adored this spicy dish. It’s just the right amount of creamy, and the peanuts and potatoes add a crunchiness and softness to the dish. The spices are fragrant and welcoming. 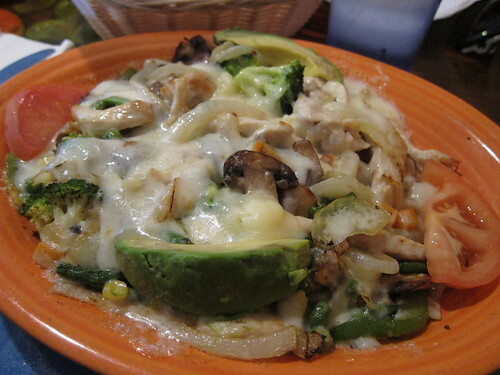 I really cannot fault this dish. 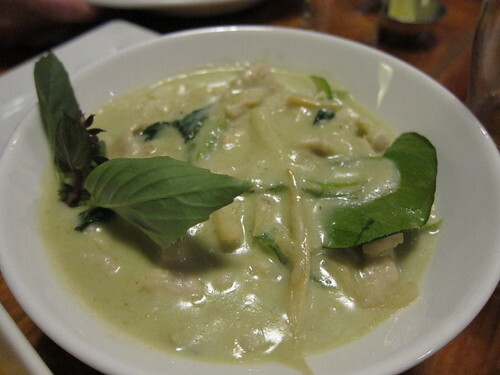 Khao San Road’s Green Curry with the lovely bamboo shoots, green capsicums, kaffir lime, basil and made creamy with coconut milk is another winner but not to the same extent as their Massaman curry. 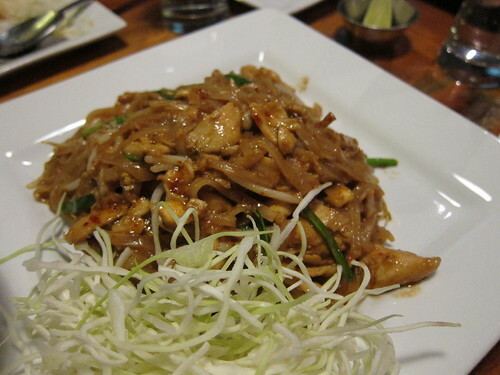 The Pad Thai was also quite good, but probably not the best Pad Thai I’ve eaten. The tamarind flavour comes through well and it tastes fresh and light. Although Khao San Road leans on the expensive side of things, I can say that you will find it hard to be disappointed with the quality of food here. Again, I must mention the lovely Massaman curry because it was the standout dish even though all the other dishes were excellent too. T’relek is another great Vietnamese restaurant in Richmond. 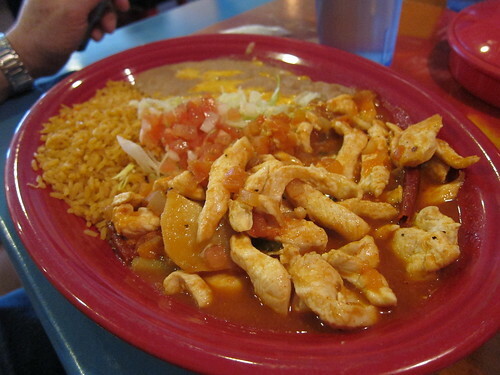 T’relek offers a great variety of dishes and delicious nonetheless. What makes T’relek different from the many other Vietnamese restaurants around these parts is cleanliness and service. I find service here to be a step above, friendly and attentive. 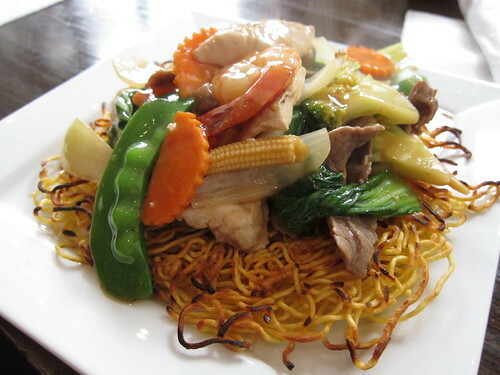 The dish pictured above is their Crispy Noodles Seafood Combination. The noodles are indeed crispy and crunchy, and with the generous offering of vegetables, seafood, chicken and beef it all works well together. The sauce is similar to an egg gravy you may find in a Malaysian Char Hor Fun, and whilst not as flavourful it still has a pleasant aroma and flavour to it. Not too salty, and enough sauce to go round. 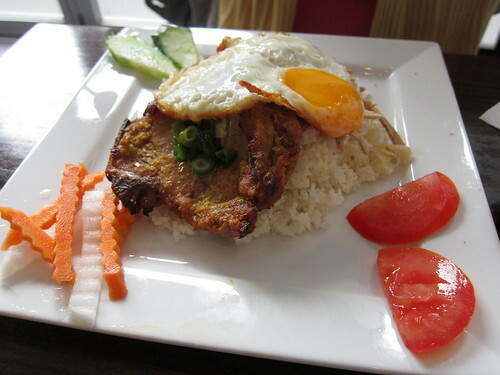 T’relek’s Grilled Pork Chop and Egg is another decent dish, with well cooked pork and a runny sunny side up egg, freshly cut vegetables as garnish and shredded pork.. It’s basically a Broken Rice dish but without the commonly added pâté. 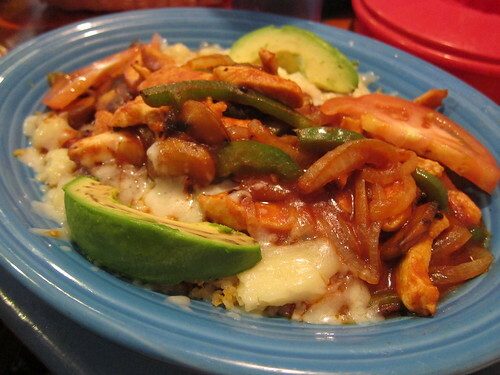 What this dish needs is a dressing sauce, sweet chilli sauce does complement this dish well actually. The Tomato Rice with Diced Beef and Stir Fried Vegetables is another generous dish, with plentiful capsicum, onions and beef. Unfortunately, the stir fry here is a tad over salted. I find the tomato rice needs egg mixed through and a tad more tomato flavour but it’s tasty but not exceptional. 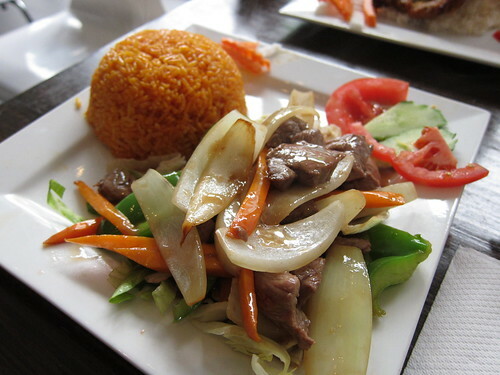 Although T’relek’s dishes aren’t the tastiest Vietnamese in Richmond, it does provide a fulfilling meal and with friendly service, you’d be hard to be displeased. Cafe Crepe on Queen St, Toronto was highly recommended to me by my sister and it appears very popular amongst the locals. I love crepes because you can eat them with something sweet or savoury but also because they are like pancakes but ultra thin and light but with a hint of sweetness and buttery flavour. 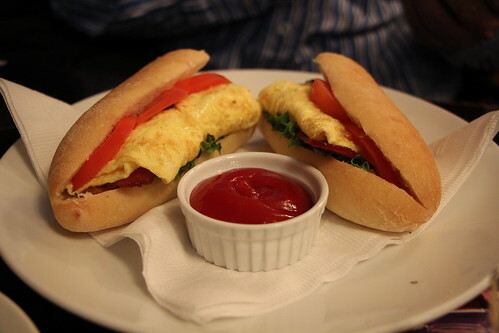 Other than their specialty crepes, they also serve Breakfast Baguettes which are basically baguettes with egg, tomato, lettuce, basil and bacon with tomato sauce as a side. It’s quite lovely, with the lightness of the egg and overall feels fresh for breakfast that doesn’t bog you down. 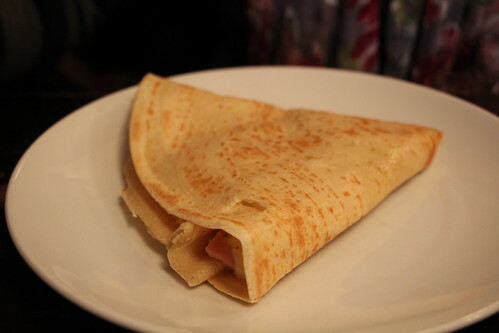 The Europa Ham and Egg crepes are on the salty side but light and delightful. 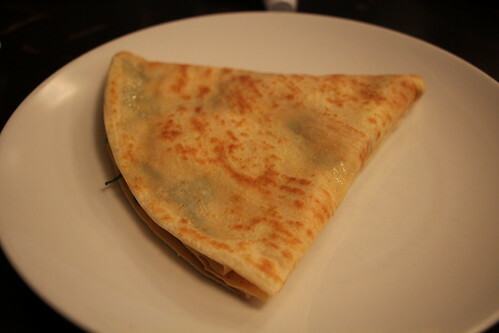 I love the thinness of the crepes, just a bit crisp and although the filling isn’t as generous as I would like, I still found it satisfactory. I love spinach and feta so I had to order the Spinach and Feta cheese crepe, again the crepes are just perfection. Not too floury or buttery and thin enough. The saltiness of the melting feta balances against the fresh spinach. Again, it’s not a heavy breakfast but it does fill you up. Cafe Crepe isn’t the most generous with their dishes but they are incredibly tasty and that’s why people keep coming back. If you want fantastic crepes, of the savoury or sweet kind, this is the place because they have so many varieties to choose from.